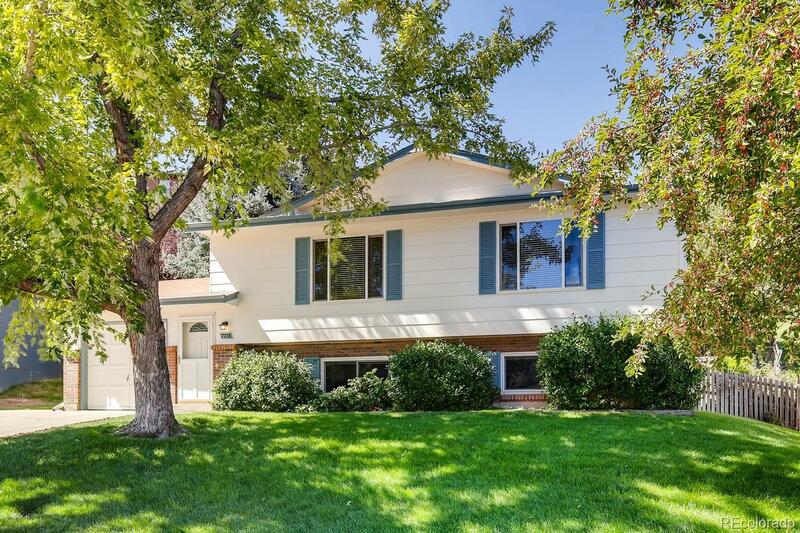 Sunny & bright, this home has been updated w newer roof, furnace, central a/c, as well as fruitwood wood laminate flooring that looks like it was just installed.Lovely spacious and efficient remodeled kitchen w granite countertops, cherry cabinets, moving island make it a versatile space. New windows too, one car oversized attached garage plus concrete pad next to driveway for extra parking. The backyard oasis has a covered deck as well as a flagstone patio, private w/ perennial gardens & sprinkler. Both baths remodeled wt tile floors, all upper level bedrooms w wood laminate flooring & lower level bedrooms have carpet. Great living space in lower level - family room/game area or flex space as well as 2 additional bedrooms, laundry. 3/4 bath. Living Room and Dining Room are an open concept and flow to the kitchen. Desirable neighborhood w easy access to 470, shopping, parks and schools.